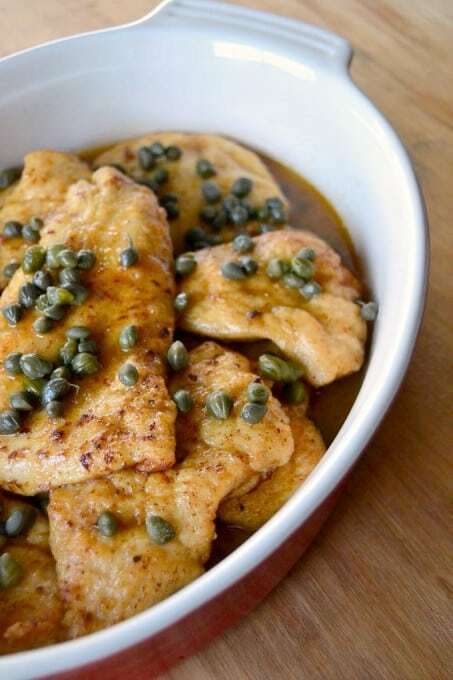 Chicken Picatta – a very easy and delicious chicken dish that you’ll be asked to make again and again. 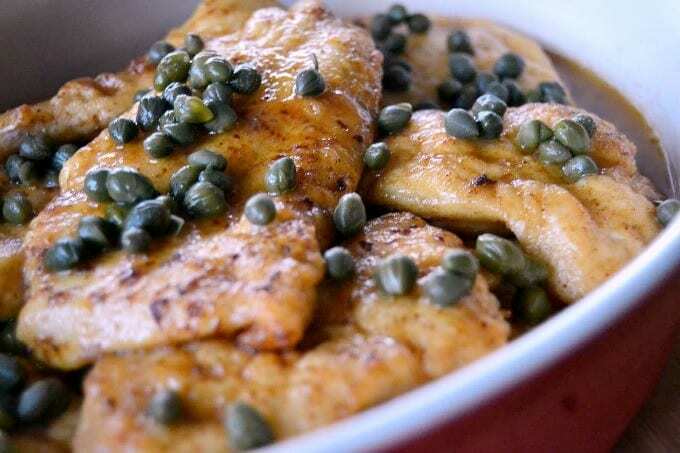 Tastes of lemon, capers and paprika will awaken your senses! I spent a good few hours typing up this post last night and was then at the final point when I needed to upload my photos. Error messages repeatedly appeared when I tried to do so. I figured I’d carry on and then go back to it. Thinking it was probably a good idea to “save” my draft, I hit the button. Uh-oh. Never seen that message before and it most certainly didn’t give me a warm, fuzzy feeling when I did. I wanted to save everything I had typed and was too afraid NOT to hit that button that I thought, duh! of course I do! Yup, what followed was that wonderful feeling when simultaneously you’re gasping for air and your heart is in your stomach. Some colorful words verbally followed, and after a few minutes of frantically searching I resigned myself to the fact that it was gone. Into thin air, never to be read again. Moral of the story as I’ve learned from some wonderful and very helpful blogger friends (and maybe this will help you as well), is to save, save, save! Saving your draft frequently can help prevent major post loss and vulgar language. Also, when receiving that message, open up another tab on the computer and log-in to save it. DON’T click as I did. Lesson learned. Ah,yes, this dish gives me and the whole family warm fuzzy feelings though. It comes from my mostest absolutely favoritest cookbook, Bon Appétit Favorites! Classic Recipes Volume One. I received this book as part of my Bon Appétit subscription years ago, and being over 20 years old, it has been very. well. loved. The pages have yellowed, are torn, contain countless stains, and are rippled having been water logged one too many times. The back has been missing ever since I can remember and the front cover along with pages 1,2 and 3 are together, but no longer attached to the book. Every recipe I’ve made from this cookbook has been a winner. No joke. Obviously from its’ wear and tear, it has been referred to again and again and again, yet there are still so many recipes left to make! Don’t worry, I’ll get there. It’s one of the reasons I have this blog – to preserve the recipes in this book for years to come. I also know that after my demise, their may be a sibling squabble over the ownership rights to this book right along with my mother’s crepe pan. Maybe I should designate them both in my will or maybe there’s a food blogger museum I could donate them to. I now have a request. So that I can get to know my readers a bit better, how I can be of better service to you and what more you’d like to see here on 365 Days of Baking and More, I ask that you take a survey I’ve put together. I cannot thank you all enough for the love and support you’ve shown me over the past four years bringing us to where we are today. I want to give you SO much more and continue to make great things, so in order to do that, I need to hear from YOU!! to the survey. Thank you so very much! I look forward to hearing what you have to say and how WE can make 365 Days of Baking and More even better!! I’ll leave the survey open until Wednesday, Feb. 25 1159 pm MST. 4 boneless skinless chicken breasts. lemon slices and chopped flat leaf parsley for garnish if desired. In a large Ziploc bag, combine the flour, paprika, salt, and pepper and toss to combine. Place the chicken breasts between two sheets of wax paper and pound until each is about 1/4-inch in thickness. Place the chicken breasts into the bag, one at a time and shake to coat. Shake of excess when removed. Preheat oven to 170 degrees F.
In a large skillet, heat the butter and olive oil over medium until it starts to bubble. Sauté the chicken breasts in groups of two for 2 - 3 minutes on each side. be careful not to overcook - no one likes rubbery chicken. It may be necessary to lower the heat a touch if butter and chicken should start to darken too quickly. Place on an oven-safe serving dish and place in oven to keep warm while cooking the remaining chicken and until serving. After all of the chicken has been cooked, add water to the skillet, scraping the bottom with a rubber spatula. Remove from heat and pour over plated chicken. 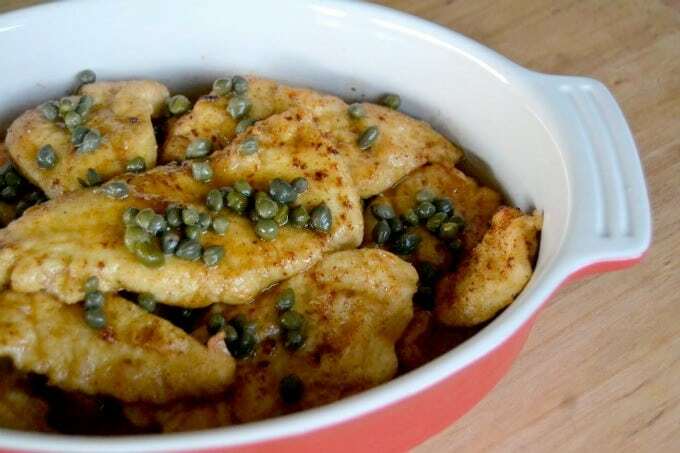 Sprinkle capers and add lemon slices and chopped parsley, if desired. 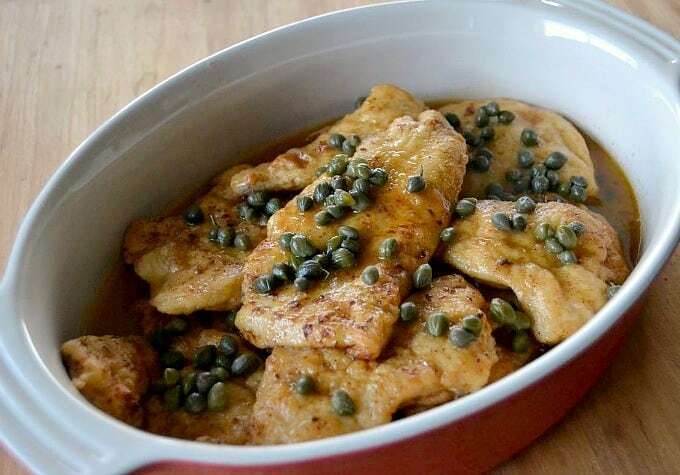 I rate everything I make on a scale of 1 – 4 with 4 being the best and this Chicken Picatta…well, you know right well it earned 4 freaking rolling pins!! Without a doubt, one of our favorite dishes of all time and it will always be a part of our menu here at the 365 homestead. I like to boost the flavor a bit, so I definitely add more paprika than is called for in the original recipe and the family loves it. If you don’t care for that much paprika, feel free to use less or use as directed in the original recipe, “to taste”. I’m not receiving any compensation for linking to the cookbook, I just wanted to share its’ awesomeness with you. I give you BIG baking hugs and muffins!! How long should I bake in the oven. Is it supposed to be 170C instead of 170 F? Audrey, the oven is set at the 170 degree F temperature to just keep the chicken warm as you cook it stove top in batches. It’s not meant to be baked in the oven. It will become too dry and rubbery if baked afterwards because they’re thin slices. Just recently found your site and Facebook page. 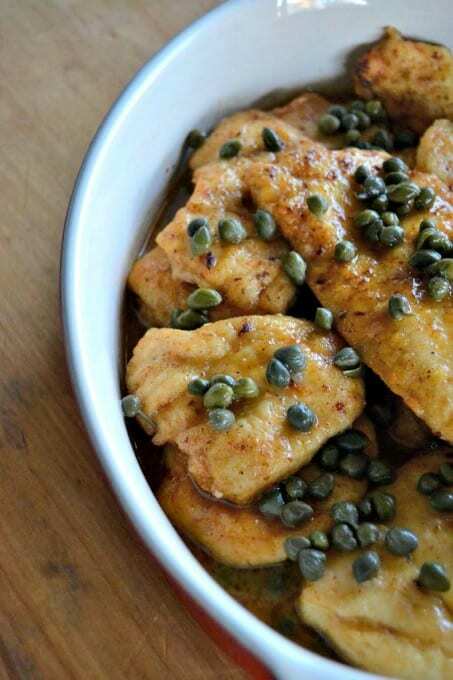 What sides typically pair best with this dish? I always serve it with wide noodles because we like the sauce drizzled over them. I also usually steam broccoli drizzled with fresh lemon juice. I don’t usually go out of the box as far as sides go – need to expand my horizons in that department. Lynne, I plan to cook this tonight and pair it with a sun-dried tomato basil orzo recipe from All Recipes, and a side salad. Thanks, Josh! I hope you enjoyed it and I appreciate you letting me know!